Good morning. These are exciting times for us.We are writing the last twenty pages of “Emotional Frustration-the hushed plague” and we would like to thank all those who have generously forwarded their suggestions and corrections to our e-mail address. A few days ago we were having lunch in “Fatair Al Basha”, a great Lebanese cafeteria and mini-market owned by our dear friend Samir, when we spotted a package of cous-cous made in Canada on one of the nearby racks. Our mind went instantly back to the readings of our youth in a Montevideo apartment, eliciting the images of a caravan of nomadic tribesmen trekking through the unforgiving sands of the Sahara. In order to survive, they often carried three critical supplies: water, cous-cous and tea leaves. On the spot we decided to prepare a cous-cous of chicken and vegetables, seasoned with a little olive oil, parsley, turmeric and honey. My son said that it was a truly superb dish. Today we woke up with renewed energy and enthusiasm to tackle our manuscript. Emulating the stoic berbers, we will momentarily mount on the back of our mouse and glide again through the glistening grains of our laptop’s screen to reach the blissful oasis. Through the blinding haze, the tower of the magic city begins to shape in the distance. Thank you God Almighty for holding our hands all along this journey. Good morning. Yesterday our family celebrated with a delicious barbecue the fabulous awards received by our two kids. We had a great time together sharing those delicious meat cuts, sausages, sweet potatoes and red bell peppers that you see in the image. However, my daughter criticized me at the table for my melodramatic writings when I was overwhelmed by the news of the Wolfson awards. Women are so cruel sometimes. Ha! When she took the first bite to that perfectly grilled skirt steak (well done outside but tender and juicy inside) she was the one that started to cry of happiness. That is one of the “dirty tricks” I have laboriously learned about women in general: to appease them go to the kitchen and prepare a delicious dish or take them to the theater to watch ballet. Thank you very much for all the kind e-mail messages that you have sent us lately. We are almost done with the manuscript of “Emotional frustration-the hushed plague.” Please continue to send us your great suggestions as we will seriously consider them. We would like to warmly congratulate the cast and crew of “Lonely is the night” for their outstanding work of so many months that has resulted in such a prestigious award. In this picture taken at the time when we were finishing the editing work, Miles posed with a T-shirt that I had gotten in a Medical Cannabis Conference in Fort Lauderdale. On the right lower corner you can see the mattress and bed cover lying on the floor that served as my sleeping quarters during the filming process; as the servants of yore, I had to rest close to the kitchen because I had to spring into action whenever hunger struck. We are proud of this achievement that we obtained with long studies and hard work. In his 1959 directorial debut, French film-maker Francois Truffaut won the Cannes Palme D’Or with his story of a misunderstood youngster from Paris that runs away from his family to discover the world. I saw the film with my father Mario in La Plata when I was studying Medicine; we both liked it very much but never mentioned it to Gian Luca. A few years ago, I found him watching this movie, lounging comfortably in a sofa. -“Because the scenes in his school gives me an idea of how tough it must have been for you to go through the French educational system, Daddy, ” he shot back. Welling up, I said: “yes, it was cruel like that. When the teacher showed up in the early morning and ordered us to take out pen and paper because there was a dictation, we all shivered like leaves in the middle of the wintertime.” We hugged each other intensely. Two years ago my son chose Miles, one of his classmates at Miami Beach Senior High School, to star in his film; we knew that he was having a checkered situation at home. Once the filming had started, my son asked me if Miles could bunk with us for some time. I enthusiastically agreed and we gladly shared our apartment in Miami Beach. For the following weeks, we had one of the most extraordinary moments of our bonding. Giani, Miles and the rest of the crew filmed inside that apartment and went out on location, sometimes at incredibly odd hours to have the street set for themselves. My humble task was, besides supporting my son financially and spiritually, to provide food and beverages for the whole crew, sometimes even happily cooking for them. We got little rest but we enjoyed together their discussion about script, scenes, locations. I believe I got magically hooked on the idea of participating in movie-making right there. Miles is a gifted yet rebellious guy who just needed some space to develop his potential and we were willing to extend a helping hand to him in times of need. In the end he rightfully made all of us proud. Antoine Doinel had also to get away from a stultifying situation to discover the world. In the last scene, Truffaut showed his feet finally touching the sea in a Normandy beach. It is a vivid metaphor for his long, convoluted journey into freedom and adulthood. Oh dear! I am choking with raw emotion. I, who prides himself in knowing something about it. When one of these events hits you in the face, you are always overwhelmed. That means that we are humans after all. Let me take a pause to cry a little bit more. The day before yesterday my daughter Noel Marie and my son Gian Luca were notified that they had both received the prestigious “Wolfson Cinemaslan Works in Progress Award” that recognizes the six most promising young film-makers of South Florida.The awards ceremony is sponsored by the Wolfson family, the Knight Foundation, Miami Dade College, the New York Film Institute , the Miami Film festival, American Airlines and many more organisations that I cannot remember now. This is tough…I am crying. We just came back from the ceremony in the Tower Theatre of Miami where last year’s nominees were given a diploma and their films were shown to an eager audience. My two children will have their work screened next year, after some necessary editing. This picture shows us in the company of Matthew Wohl, the event’s director (on my right side) and Will McCurdy, the traffic cop (on my left side, crouching). Thank you very much, from the deepest recesses of my spirit, for this incredible joy you are giving us. We would like to have a special remembrance for my mother Gladys and my father Mario who are certainly watching from Heaven the triumph of their grandchildren. We will post an edited video of the ceremony with the corresponding information later. This kind of artistic events make us proud to live in South Florida. Let’s have more of it. Good morning. We would like to wish all our female readers and contributors a Happy Valentine’s day. Your sustained, spontaneous and superb affection keeps us going. We are writing the last 50 pages of our book “Emotional Frustration – the hushed plague” and we always keep your dear images, voices and kisses in our mind to inspire us. Did you notice that we have posted a new background image? 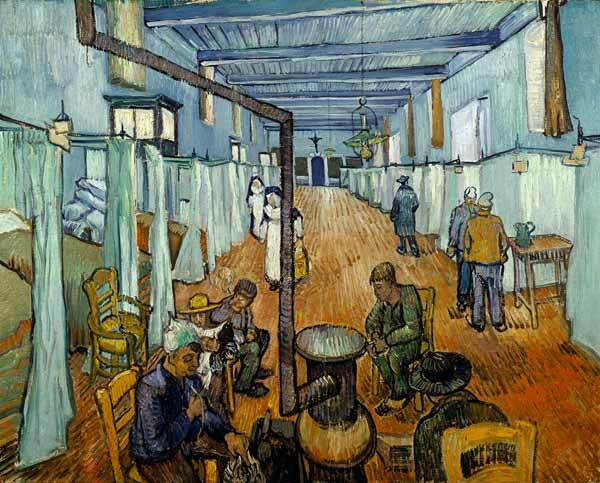 It’s a depiction of the clinical ward of the Arles hospital by Vincent van Gogh and it shows some busy nuns taking care of the patients. The devoted women in our lives are the unrelenting healers of our wounds. Let us honor them today and remind them that we love them very much.